Review: Earlier this year, Bill Clinton undertook a publicity tour — his first in some time disconnected from his wife’s political career, and one designed to promote a thriller novel he’d co-written with James Patterson. But what perhaps was meant as the 42nd president’s sprightly display of charisma and distraction from the news generated by the 45th quickly became something for which he was, strangely, hardly prepared. Faced with questions about his treatment of White House intern Monica Lewinsky, he bobbled them badly, seeming defensive and aggressive, unwilling to let in any point-of-view other than his own narrative in which he’d long since been forgiven. It was the sort of reckoning that has been a long time coming, first because of an ongoing revolution spurred on by movements like #MeToo and Time’s Up, and second because of our culture’s sudden interest in relitigating events of the 1990s. That latter motive is demonstrated by A&E’s new six-part documentary, “The Clinton Affair,” a panoramic look at Clinton’s dalliance with Lewinsky and the manner in which it led to his impeachment. While the documentary gives Lewinsky a meaningful say, it’s missing the sort of editorial eye one might expect from a film produced at a moment in which our culture finally seems ready to evaluate Clinton without falling for his charisma. This docuseries is a step forward; it uses the tools of the historian, patiently working the facts of a still-familiar story to draw out its portrait of a moment. Its format, though, feels at times a bit stale. Following a crisply edited narrative from Clinton’s election through early scandal and government shutdown towards Lewinsky, the film treads well-known ground. This tale is certainly a remarkable one, culminating in Lewinsky’s practically being held hostage by the FBI in a hotel, but years on and many tellings later, it tends to sag somewhere around Whitewater. Director Blair Foster marshals a vast quantity of facts and of footage (from contemporaneous news reports to present-day interviews), but this story, too, might have been pruned back. Perhaps the element of the documentary that works best is the inclusion of Lewinsky and Clinton harassment accuser Paula Jones on-camera. It’s a moving choice, as both women are at times visibly overcome while recounting their experiences. It’s worth noting that Lewinsky has for years written elegantly and wrenchingly about her time in the national spotlight; indeed, her Vanity Fair column about deciding to appear in “The Clinton Affair” may be more revealing and thought-provoking than her narration of her experience in the documentary. But it’s an experience worth having documented here. If the Clinton affair (not, as Lewinsky pointed out in her column, the Lewinsky scandal, for once) was a culture war, it was one in which all the munitions were pointed at one individual, and not the one who was President. Depicted having coming through the experience with insight and clear-eyed ability to tell her story, Lewinsky’s presence makes a statement. So, too, does the absence of Clinton, or anyone able to explain why he did what he did. The events of the 1990s have of late become the stuff of historical drama for the first time, with fictionalizations of the Anita Hill hearings, the trial of O.J. Simpson, the crimes of Andrew Cunanan, and the Tonya Harding scandal on the small and big screens. Those works, executed with varying degrees of success, have the power to invent and marshall emotional truths in service of a grand argument. 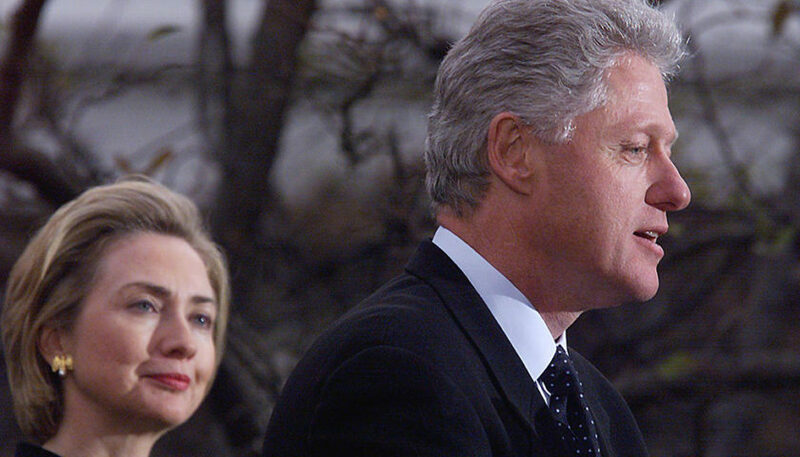 “The Clinton Affair” gives viewers less in the way of overarching ideas to chew on. But it does generate a sense that Clinton is being evaluated — not by the blogosphere but by as exhaustively curious a lens as could exist — and coming up badly wanting. As such, it breaks through its format, and feels less like a staid work of recitation than a turning point. “The Clinton Affair.” A&E. Six episodes (five screened for review). Premieres Sunday, Nov. 18. Executive Producers: Alex Gibney, Blair Foster, Stacey Offman, Jemima Khan, Henrietta Conrad, Elaine Frontain Bryant, Molly Thompson, Evan Lerner.